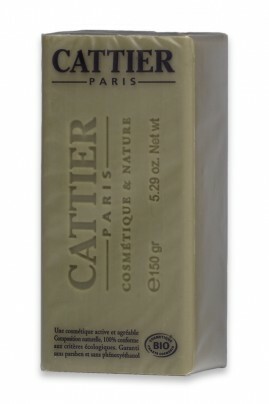 Cattier Organic Soap Alargil gently cleanses oily skin and hyperseborrhoeic epidermis (sebum excess). Its formula rich in green clay absorbs sebum and neutralizes impurities. Antiseptic and astringent cedar essential oil purifies the skin. Your skin is clean and smooth, with fresh complexion and tightened pores. Very gentle, Cattier's Natural Soap Alargil can be used daily on face and body. Moisten Cattier Natural Soap Alargil and lather onto your hands. Apply the foam on wet face and body then rinse with clear water. Can be used day and night. A gentle natural soap packed with purifying ingredients !